Today On Monday 26th November one year of American Forces attack on Salala check point near Afghan border is over in which 24 Pakistan Army soldiers where martyred. After this attack relations between Pakistan and US where broken badly and Pakistan also stopped Nato Supply. Following are tweets by Pakistanis after one year of this attack. 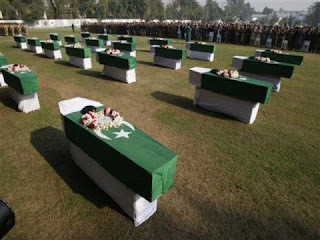 1 year ago today, 24 of Pakistan's bravest gave the ultimate sacrifice at Salala. They fought for us - the least we can do is remember them. PAK ARMY SHAHEEDS OF SALALA MASSACRE SEE ANOTHER SUPERPOWER GOING DOWN IN AFGHANISTAN. Remembering Shaheed Maj.Mujahid, Shaheed Capt.Usman & other soldiers martyred durng attack on #Salala checkpost. Nation will always b thankful2u! I lost my brother in law in Salala attack. Its been a year.